A: I stated China's stance yesterday. I would like to reiterate that China's firm opposition to the THAAD deployment in the ROK by the US is clear-cut, consistent and firm. 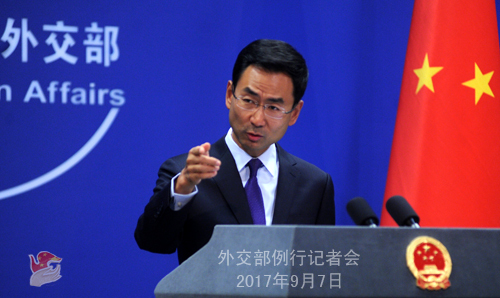 We again urge the US and the ROK to value the security interests and concerns of China and other regional countries and immediately stop the relevant deployment and remove the relevant equipment. 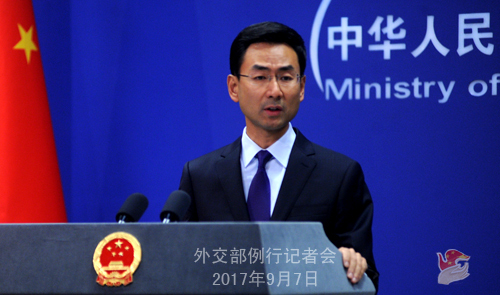 The Chinese side has lodged stern representations with the ROK regarding this issue. Q: When taking questions from the press after a meeting with Nepalese Deputy Prime Minister and Foreign Minister Krishna Bahadur Mahara, Foreign Minister Wang Yi said that, given the new development of the situation on the Korean Peninsula, the Chinese side agrees with the UN Security Council on further reaction and necessary measure. Will China support cutting off oil supplies to the DPRK? What does China mean by further reaction from the UN Security Council? A: Foreign Minister Wang Yi has said that the Chinese side agrees with the UN Security Council on further reaction and necessary measure. As we stressed on multiple occasions, in response to the 6th nuclear test by the DPRK, how the UN Security Council will react and what measure it may take depend on the results of the discussion by its members. This cannot be decided by China or any particular member of the Security Council alone. As to the specific measures you are asking about, as we stressed many times, we hope the reaction and measure of the Security Council will be conducive to advancing the denuclearization of the Korean Peninsula, upholding peace and stability on the Korean Peninsula and promoting the peaceful settlement of the Korean Peninsula issue through dialogue and negotiation. Committed to this stance, China will participate in the discussion in the Security Council in a responsible and constructive manner. Q: The High Representative of the European Union for Foreign Affairs and Security Policy Federica Mogherini said yesterday that the EU is preparing new sanctions against the DPRK. Does China support this kind of sanctions? A: I don't know what the so-called new sanctions from the EU mean. Does it refer to unilateral sanctions by the EU? If so, as we stressed multiple times, we don't agree with unilateral sanctions. If you mean that the EU supports new sanction measures by the Security Council, then as I said just now, how the Security Council will react and what measures it will take depend on the results of the discussion by its members. Q: It was widely reported in June that Ivanka Trump and Jared Kushner were going to visit China. Can you confirm that? Can you tell us whether that visit is still going to happen? A: China and the US have maintained close communication and exchange at various levels. Q: Did President of Guinea Alpha Condé discuss mining contract with China during the BRICS Summit? Do you have any details? A: At the invitation of President Xi Jinping, Alpha Condé, President of the Republic of Guinea and Chairman of the African Union, came to attend the Dialogue of Emerging Market and Developing Countries in China recently. On the sidelines of the Dialogue, the two heads of state held a bilateral meeting and exchanged views on further developing China-Guinea Comprehensive Strategic Cooperative Partnership. We have issued the readout of the relevant meeting already. During the meeting, the two heads of state have unanimously agreed to deepen the two countries'cooperation on agriculture, fishery, mining and other fields. The relevant departments and enterprises of the two countries have discussed and aligned their friendly and mutually beneficial cooperation and achieved positive outcomes. Q: The US has proposed oil and natural gas embargo on the DPRK in the draft sanction resolution submitted to the UN. Do you have any comment on that? A: I answered a similar question just now. I would like to stress again that, in response to the 6th nuclear test by the DPRK, how the UN Security Council will react and what measure it may take depend on the results of the discussion by its members. In the meantime, we hope the reaction and measure of the Security Council will be conducive to advancing the denuclearization of the Korean Peninsula, upholding peace and stability on the Korean Peninsula and promoting the peaceful settlement of the Korean Peninsula issue through dialogue and negotiation. Q: The Wall Street Journal reported yesterday that some Chinese universities continue to train the DPRK students in sensitive fields like mechanical engineering, despite the relevant sanction resolutions adopted by the Security Council. Do you have any comment? A: I am not aware of what you said. China has always been implementing the Security Council's DPRK-related resolutions comprehensively, accurately, earnestly and strictly and fulfilling our international obligation. Q: There are reports that after the phone call with President Xi Jinping, President Trump claimed that they are 100% in agreement over the DPRK. Is it true? A: Last night Beijing time, President Xi Jinping and President Donald Trump had a telephone conversation. We have issued the relevant readout and I believe you have read that. As to the question you mentioned, I can not give you a very quantitative description. What I can tell you is that, China and the US share common views on realizing denuclearization of the Korean Peninsula, upholding the international non-proliferation regime, safeguarding peace and stability on the Korean Peninsula and promoting the peaceful settlement of the Korean Peninsula nuclear issue through dialogue and negotiation. The two sides also maintain close communication and coordination on the situation on the Korean Peninsula. Q: President Trump said yesterday that military act against the DPRK will not be the first choice for the US. Does China think that it is a positive statement from the US? A: We have always stressed that the use of military means is not a viable choice and sanctions alone will never be a way out. The Korean Peninsula nuclear issue, in the final analysis, should be resolved through dialogue and negotiation among various parties while addressing their legitimate security concerns in a balanced manner. 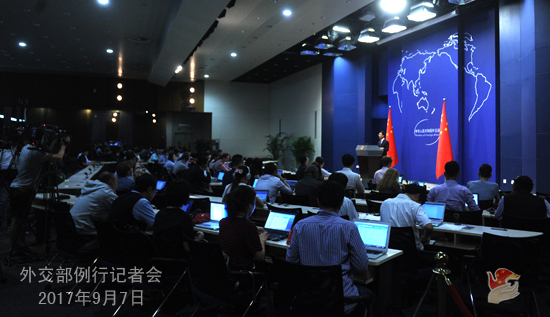 In this regard, China has put forward the "dual-track"approach and "suspension for suspension"proposal. We hope the relevant parties can give serious consideration to them and respond positively. Q: Are you saying that you are not aware of any plan of Ivanka Trump and Jared Kushner's visit to China in September? A: As I said just now, China and the US have maintained close communication and exchange at various levels. Q: The Indian army chief said that India must be prepared for war. He also accused China of testing the limit of India. Do you have any reaction for that? We have noted the remarks of the relevant person with the Indian military, which are deemed as shocking words by some Indian media. I don't know whether he was authorized to make such comments and whether they were made impromptus personally or on behalf of the Indian government. China and India are each other's important neighbour and we are the two largest developing countries and emerging markets. A sound and stable China-India relationship serves the fundamental interests of the two peoples and is the shared aspiration of this region and the international community at large. Two days ago, during his meeting with Prime Minister Narendra Modi, President Xi Jinping pointed out that, China and India should stay committed to the basic judgment that two sides present development opportunities rather than threat to each other. We hope the Indian side can look at China's development in a correct and rational manner. We shall show the world that peaceful coexistence and win-win cooperation are the only right choice for China and India. The two sides should respect each other, seek common ground while shelving differences and uphold peace and tranquility in our border areas. Prime Minister Narendra Modi said that India stands ready to work with China and ensure the steady development of the relations between the two countries. The two sides should not take each other as rival but make cooperation the mainstream of their relations. China and India need to jointly uphold peace and tranquility in the border areas. We hope the relevant person with the India military can see clear the historical trend and come out with more words and deeds conducive to the development of China-India relations. Q: Did President Xi Jinping and President Donald Trump exchanged views on the THAAD deployment by the US and the ROK during the phone call yesterday? A: Both China and the US have issued the readouts of the telephone conversation between the two heads of state, and they are very clear. You may refer to the readouts for details of the telephone conversation, both the Chinese and the US ones. The Foreign Ministry and the People's Government of Jiangxi Province will host a promotion event for Chinese provinces themed An Open China: Beautiful Jiangxi Showing Her Charm to the World on the third floor of the Southern Building on 3:30 p.m. 8 September. Foreign Minister Wang Yi will address the event. The Party Secretary of Jiangxi Province Lu Xinshe and Governor Liu Qi will respectively deliver speeches and presentations. Foreign diplomatic envoys and representatives will also be invited to make remarks and interact with other guests. Jiangxi boasts beautiful mountains and rivers and abundant culture heritages. It is where Jingdezhen porcelain, the artistic treasure of the Chinese nation, originated and found its way to the rest of the world, which serves as an important economic and cultural bond for the ancient Eurasian region. As the cradle of the People's Republic, the People's Army and the Chinese revolution and thanks to its crucial geographical advantage of adjoining the delta of Yangtze River and Pearl River and the triangle of southern Fujian, Jiangxi has become a key area that supports the strategy of developing the hinterland as part of the Belt and Road Initiative. In the new historical stage, a more open and dynamic Jiangxi is attracting worldwide attention. We welcome your participation and covering of this event.